As plain as they may be, I do often find myself munching on rice cakes as a quick "healthy" snack when on the go. 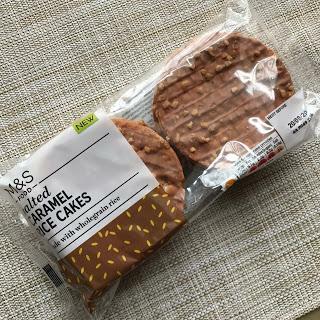 My favourite ones are Kallo Dark Chocolate Coated Square rice cakes, and I've rarely ventured into trying the more fancy flavours now being made such as yogurt, berry etc., but one newbie to the rice cake world that caught my eye recently were these Marks and Spencer Salted Caramel Rice cakes. 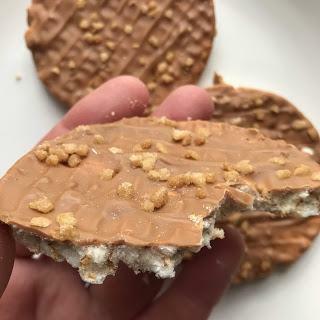 They're priced at £1.30 for 6 and described as "whole grain rice cakes with a white chocolate and caramel coating sprinkled with crispy salted caramel flavoured pieces". With that description I was hoping for something a bit like a Caramac/Blonde chocolate coating, but that's not exactly what I got. It's pretty much regular white chocolate with caramel flavouring and colouring added. Not to worry though because these are still very tasty! 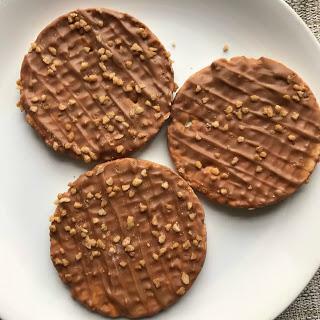 Most of the flavour comes from the crunchy pieces which are very flavoursome indeed, nicely balanced between caramel toffee like flavours and salt. 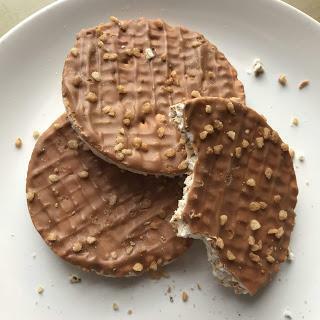 They really lifted these rice cakes from something ordinary to being quite a tasty treat, whilst presumably still being on the healthier side. The chocolate coating was nice, but I do wish it had been thicker. All in all as far as rice cakes go I would highly recommend these! They deliver the promised combination of white chocolate and salted caramel flavours which is really all we want isn't it? Now me being fussy, I would like to see a true blonde chocolate style rice cake! Though I imagine they might cost a bit more I'd be willing to pay for it!